Às 8h30, você encontrará seu guia no hotel, na estação ou no porto de Catania. Com seu grupo juntos, você viajará na direção de Rifugio Sapienza, a estação base no sopé do Monte. Etna. Desfrute de paradas ao longo do caminho para absorver as vistas e aprenda sobre a história e a geologia do vulcão mais famoso e temível da Sicília. Saia do seu transporte no Rifugio Sapienza e caminhe pelas encostas do vulcão, ao longo de uma das trilhas do Parco dell'Etna que se eleva a uma altitude de 2.000 metros. Se você quiser subir mais alto, fale com seu guia no dia. Outras opções estão disponíveis para continuar de teleférico e microônibus, embora isso seja a um custo extra que é pago localmente. Bate-papo com os guias alpinos como você anda e, em seguida, voltar para baixo o vulcão por microônibus e teleférico. De volta ao nível do solo, é hora de ir para o subsolo e visitar uma caverna de lava com a ajuda de tochas e capacetes. Depois de explorar a longa caverna vulcânica, você começará sua jornada de volta a Catania. Desfrute de uma parada final ao longo do caminho em uma fazenda orgânica em Zafferana e prove algumas iguarias locais, como vinho, mel e azeite. Seu monte Etna dia de viagem, em seguida, termina com um drop-off no seu hotel. This was a great trip. It included everything as advertised. The cable car ride was fun, and the views from Etna were amazing!!! Our guide Marina was exceptional. She explained everything so well and made the trip both fun and educational. She was very kind, and you will be lucky if shes your guide. It is cold at the top but you can rent coats for three euros each when you exit the cable car. I highly fecommend you do this, or you will freeze. Fabulous tour by Franco!!.. He was very knowledgeable and engaged everyone in the the van speaking English and then German. We were from US, Romania, Germany and London. Franco really made it fun! Suggestion.. be prepared if you are going up to see the 1st crater we did, the difference in temperature was about 35-40 degrees F. Jackets were available to rent. Franco, our tour guide, was awesome. Request him if you can! His enthusiasm was obvious, and he did everything he could to make sure we had an enjoyable trip. We had 6 people in our group, and Franco drove the mini van to Mt Etna, with a stop along the way to get out and have a look, and he pulled over a couple times to point something out to us that he was explaining. We got as far as you can go with the mini van, and we decided to take the option to pay 63euro extra we had read thoroughly and knew this was not included, others in our group did not know this until Franco told them on the way there to get the cable car then a 4x4 to 3000m. I definitely recommend doing this, from the bottom of the cable car there are a couple of craters you can walk to see, but I think it's worth going up higher for a better view. Of the 63euro, 9euro is for a guide at the top, which I thought was a waste but unfortunately I don't think there is a way around it. Technically Franco isn't supposed to 'guide' us there, but the designated guide had a group of at least 50 people and it was just too many to keep together and not personalised. Although he wasn't supposed to, Franco answered our questions and told us lots of information there anyway. We had a little time for some lunch at the bottom of the cable car, then into the lava caves which was really cool and again Franco was fantastic at explaining everything. Then the tasting place he initially took us to was really busy, so Franco instead took us to one just around the corner which we had to ourselves to try lots of different types of honey and olives and pesto and wines. The tour itself has a good itinerary and shows you lots, but Franco really enhanced it and his knowledge and enthusiasm was amazing. Thanks Franco! Also bring a jumper/sweater if you go to 3000m! It is possible to hike up Mount Etna, but definitely look into the details. I heard it takes about 6hrs it looked like people got a bus to the bottom of the cable car and then walked from there and is very steep. Other people got the cable car 30euro and then walked the last bit rather than get the 4x4 but that still would have been quite a decent walk. It is also possible to go higher than 3000m but this had to be a guided tour not sure of the cost. 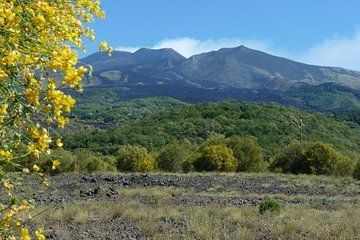 So there are plenty of options if Etna is all you want to do, but I think this tour is pretty great at giving you a taste of lots of things no time to walk on the tour though, either stay at the bottom of the cable car, or get the 4x4s. We couldn't have asked for a better tour guide. Franko was very knowledgeable about Etna and he explained the different eruptions while still being interesting. The volcano was beautiful but since we had varying aerobic abilities we chose to go for a short hike. Afterwords we went to try honey, wine and olive oil at a local specialty shop. We even ended up purchasing a few products that were our favorites. Overall it was amazing and I would recommended it for anyone who wishes to see Italy's natural beauty. Really interesting tour. The guide was very good. We chose to pay the extra to table the cable car and bus up to 3000 m. That was good though the alpine guide at the top wasn't as interesting. Very different to Vesuvius. Really enjoyed the tasting too. Visiting Catania without this trip is meaningless. We had an excellent professional guide/driver, Franko. We were picked up from NH hotel by minibus up to Rifugio Sapienza 1920 m. above sea level. From there we bought an additional ticket to reach 2504 meters by cable car andl then continued with special 4x4 minibuses to arrive at Torre del Filosofo, 2900 meters. This is the most difficult part of the trip. The alpinist guide who accompanied us was not as professional or friendly as Franco. My wife and I fall down several times on the ice without being seriously hurt. Upon returning to Rifugio Sapienza by the minibus and cable car we found Franco waiting for us. On our way back to the hotel we were able to explore a lava cave with helmets and torches and stopped at a famous organic farm, in Zafferana, for a delicious sampling of honey, wine, oil and other typical products. I forgot my winter scarf in the bus and phoned the company upon arrival to my hotel. I was astonished that in less than half an hour Franco came to the hotel by his own car to return it back to me. This is what we call professionalism. This 1/2 day tour was awesome. Our guide Franko was the best. He let us take photos throughout the drive up and down the volcano and was extremely informative and funny. The tour itself was one of the best parts of our visit to Sicily and would recommend this to anyone. Everything was super- the leader Franco did very good job. Thanks. Irena and Julia from Lithuania.